One of the most significant changes to the Windows 7 interface is its new taskbar, which acts more like the Mac OS X dock than the Windows taskbar of old. Here are a few quick tips for using the new taskbar and tweaks for taking charge of it. One of the nicest things about the taskbar is that when you hover your mouse over the icons in it, you can see thumbnail previews of all open windows for each of those applications. When you do so, there is a slight delay before the thumbnail appears. But you can make the thumbnails display more quickly by using a Registry hack. 1. Launch the Registry Editor by typing regedit in the Search box and pressing Enter. 2. Go to HKEY_CURRENT_USER\Control Panel\Mouse. 3. Double-click MouseHoverTime. The default value you’ll see is 400 — which means 400 milliseconds. Type in a new, smaller value — 150 is a good bet. Then click OK and exit the Registry Editor. You’ll have to log off or restart your computer for the change to take effect. It’s easy to rearrange the icons across the bottom of the screen — simply drag an icon to where you want it to live. You can also add icons to the taskbar by dragging them from an application, and delete the icons by highlighting them and pressing the Delete key. The notification area, at the far right of the taskbar, shows system messages and alerts, and displays the icons of programs and services that typically run in the background, such as Windows 7’s wireless service. But what determines when, how and which icons show up there seems one of Windows’ great mysteries. There’s a simple way to find out, and better yet, to customize it. 1. 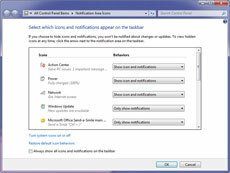 Right-click the taskbar, select Properties, and from the dialog box in the notification area section, click Customize. 2. For each application, select from the drop-down box whether you want the icon and notifications to always be displayed, to never be displayed or to have an icon appear only when there’s a notification of some kind. Click OK when you’re done. You can also customize the system icons and services that appear there, including the clock, volume, network, power and Action Center icons. At the bottom of the same screen, click “Turn system icons on or off,” and from the screen that appears, choose whether to turn on or off the icon and notifications. Click OK twice when you’re done.